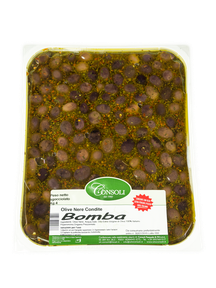 The Bomba black table olives are obtained from olives cultivated on the volcanic slopes of Mount Etna, particularly from Simeto River Valley and Catania Valley. The Company uses rural traditional processing techniques in compliance with the EEC food safety legislation. 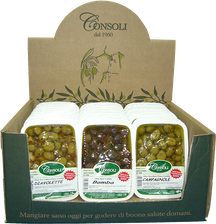 Olives Variety Moresca e Tonda Iblea. 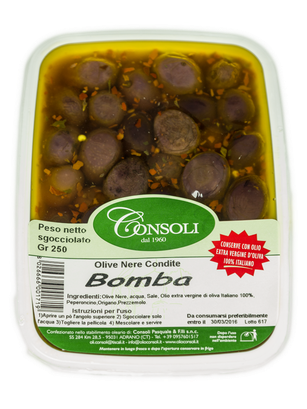 Black olives, 100% Italian extra virgin olive oil, parsley, oregano, chilli peppers. Ideal to serve with aperitif , cured meats, cheese and homemade bread.